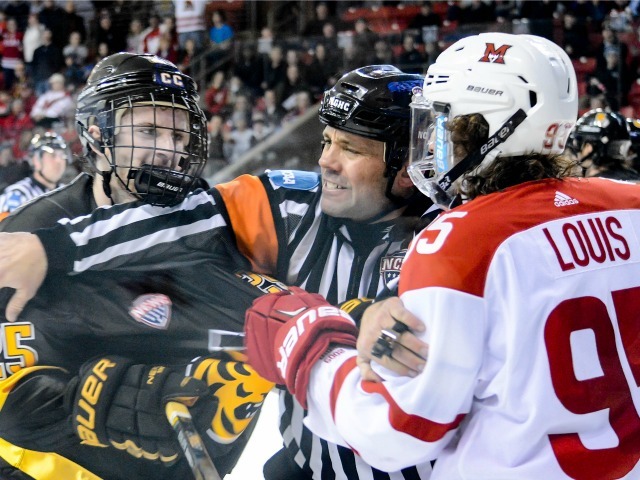 Images from the series played between Colorado College and Miami at Cady Arena on Dec. 9-10, 2016. All photos by Cathy Lachmann/BoB. OXFORD, Ohio – It was a fun way to end a not-so-fun streak. 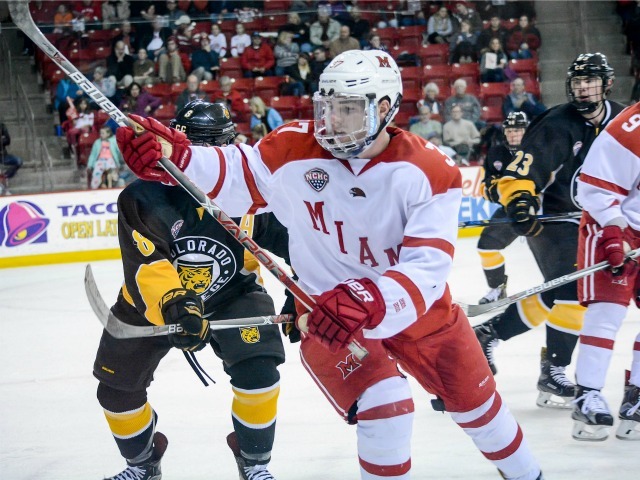 Miami trailed, 2-0 midway through the third period but ended up beating Colorado College, 3-2 in overtime at Cady Arena on Saturday. The RedHawks (4-8-2) finish the first half of the season with <— that record. It was a bittersweet win for a number of reasons. 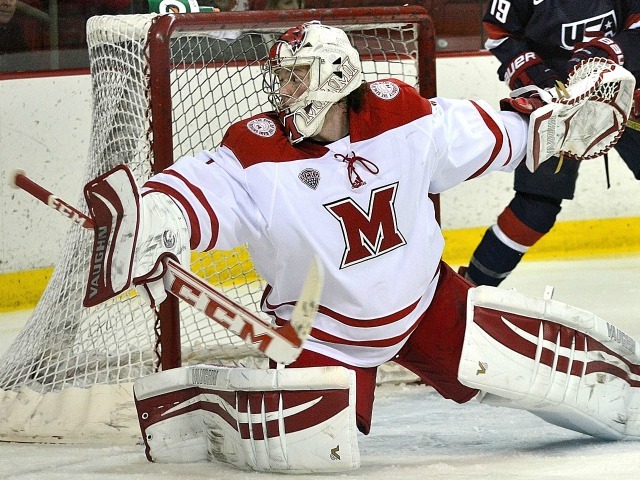 Miami goalie Chase Munroe (photo by Cathy Lachmann/BoB). PROS: Great comeback. 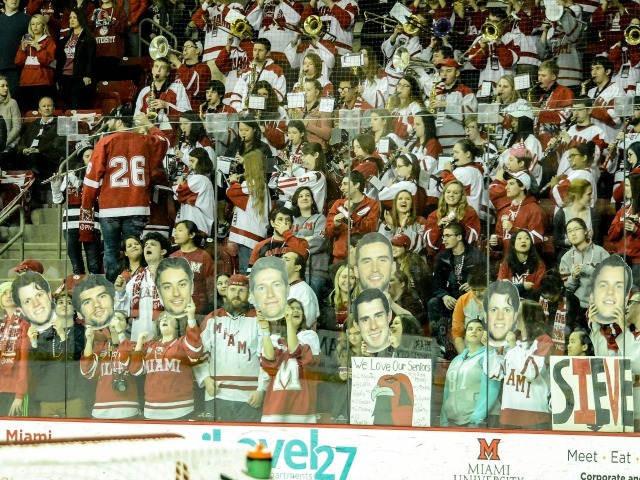 Some of the most intense hockey Miami has played in the final stretch of the game. 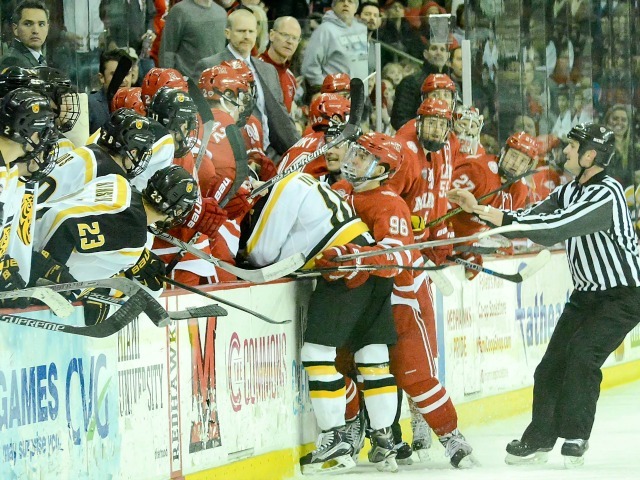 The RedHawks were physically involved. The win gives the team some momentum heading into the break. Chase Munroe was solid in net, earning his first career win. 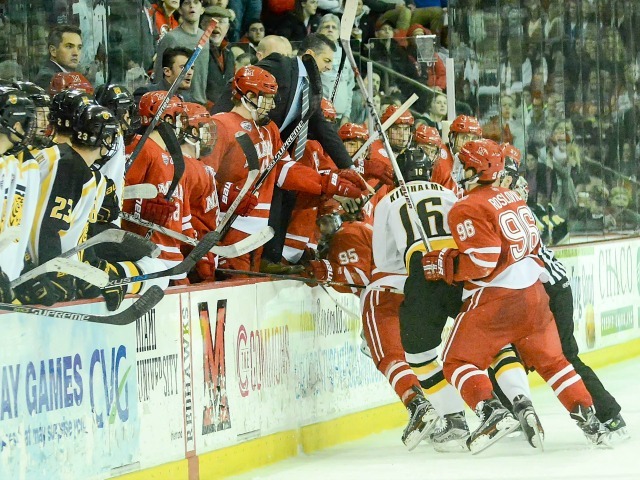 CONS: Colorado College was ranked 48th in college hockey entering the weekend. Miami shouldn’t have needed motivation to play the first 50 minutes. Any momentum from this win could be squelched by 20 days off. 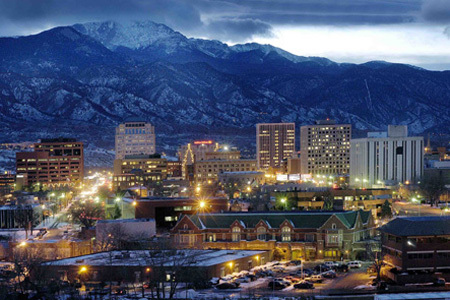 Not to be a downer, but the first con should count double. 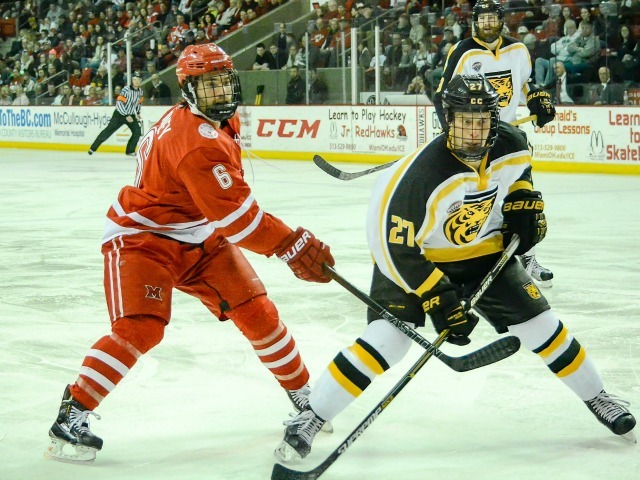 Last season it seemed like the RedHawks were ready to take the NCHC by ice storm after Jay Williams shut the Tigers out for a two-game series, becoming the first MU player to accomplish that feat. They were the last wins of the season for Miami. This fall, people see the team record and ask what the team’s problem is. It’s not an east question to answer and most don’t accept the offer to have a few pints and discuss. As a season ticket holder for 11 years one tries to dwell on the positives, but one has also seen a couple hundred games in this rink and knows to keep perspective after an emotional regular season win or loss. It’s a long season with many, many ups and downs. 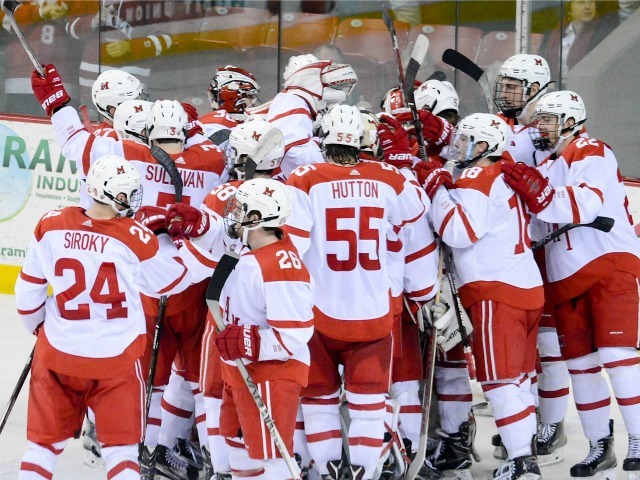 The coaches say the process is paramount, but with the exception of the occasional bad bounce and goalies stealing games, process and record typically are directly proportional. This comeback win with a spectacular ending was great for the team and the fans, but it only counts as one win, and because of the 16 games before it, Miami has to put together a lot more ‘W’s in the next three months. 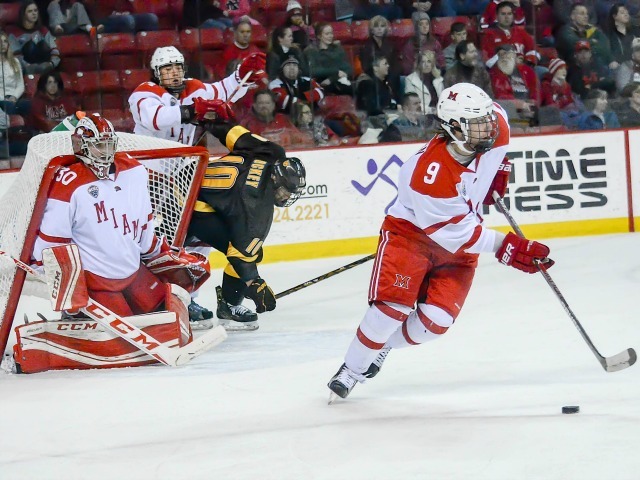 – If you haven’t seen Josh Melnick’s game winner, the link is at the end of this explanation, but it requires setting up because it’s hard to see the puck, even after several views. Go to the 3:35 mark and change the setting to “slow”. Carson Meyer shoots the puck from along the boards, and it goes out of sight for a second, but keep an eye around Melnick’s right knee. The puck reappears, drops toward the ice and he bats it into the net. Amazing goal. 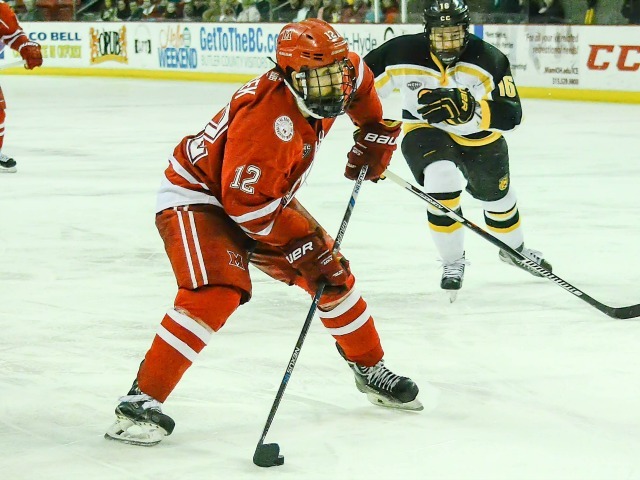 – Loved seeing Karch Bachman use his speed to create Miami’s first goal. He threw the puck into the corner, chased it down and fed it to Willie Knierim in front of the net. Look forward to seeing him showcase his skills more the next 3½ years. FORWARDS: B. Was hovering around a flunking grade halfway through the third period. This corps still didn’t help create a power play goal, but the puck movement and chances were a lot better. 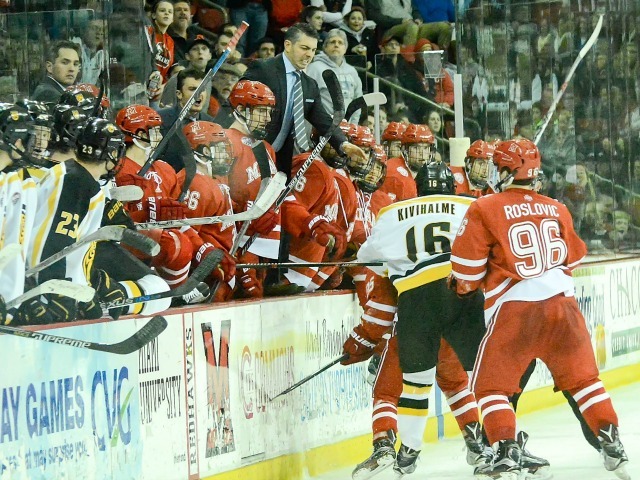 Coach Enrico Blasi is still adjusting the lines but overall the line chemistry seemed improved over Friday. Meyer has been a huge help since returning. 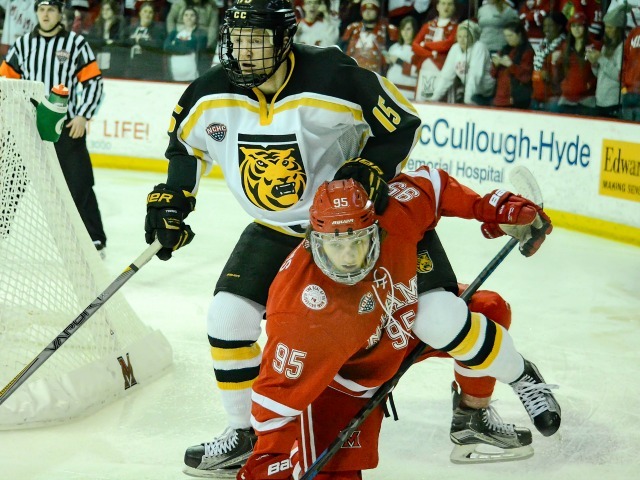 DEFENSEMEN: C. Chaz Switzer’s turnover ended up in Miami’s net, and a total breakdown resulted in the odd-man chance that became Colorado College’s second goal. 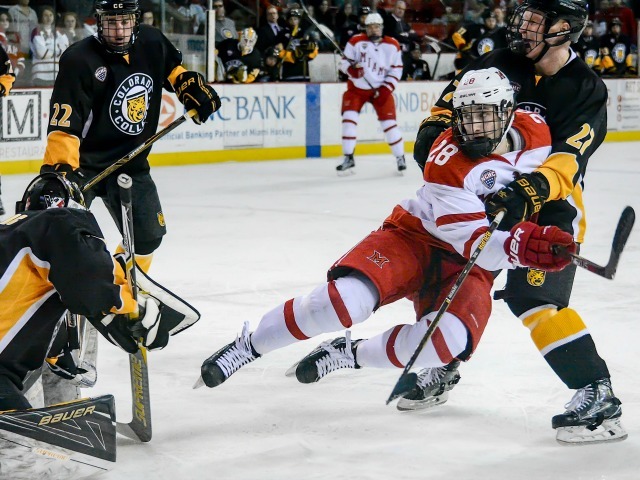 Mistakes will happen but they will get a lot harder to overcome when the RedHawks play the loaded schedule they have awaiting them in January and February. GOALTENDING: B+. 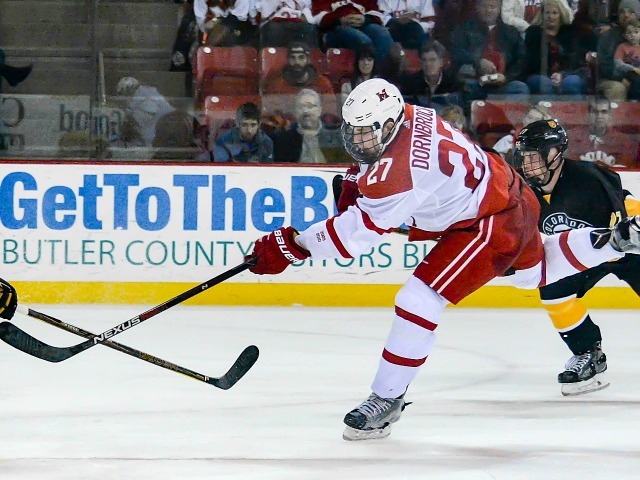 Munroe’s first and second starts were polar opposites. He looked calm on Saturday and nervous in his starting debut. He controlled his rebounds and stopped all of the routine shots in this game. The first goal was on a breakaway. 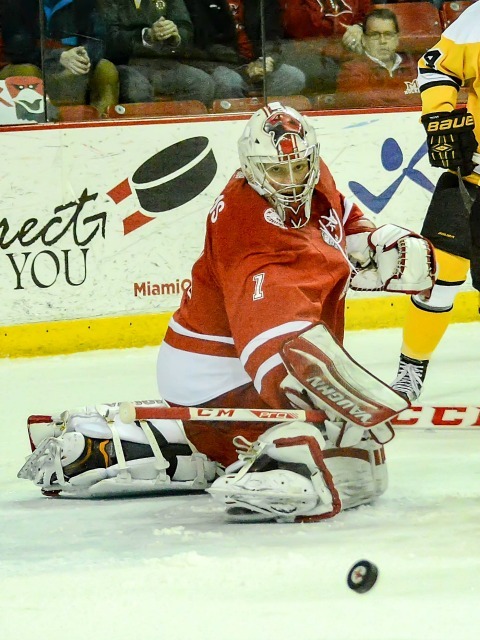 The second was on a 2-on-0 that he made a spectacular initial save on before the follow-up was banged in. So neither were on him. 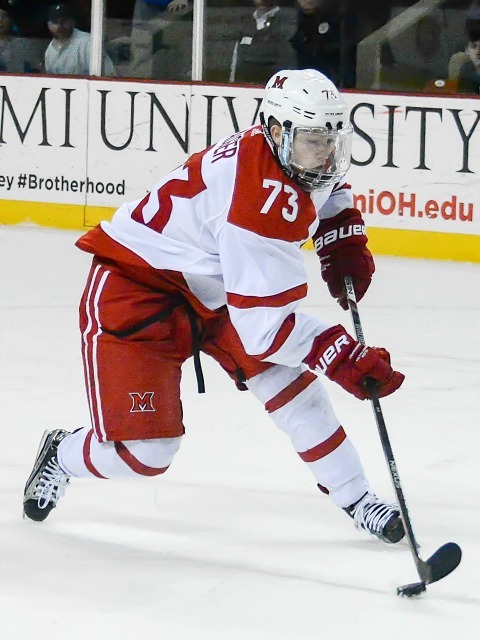 LINEUP CHANGES: Blasi benched two-thirds of his third line on Saturday – Ryan Siroky and Zach Lavalle. 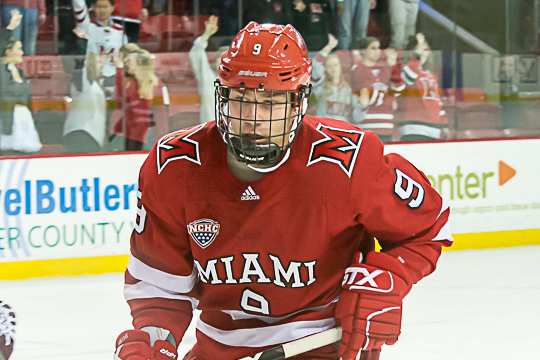 Alex Alger was back in the lineup after sitting for three games, and Knierim returned to the ice and scored the first Miami goal. 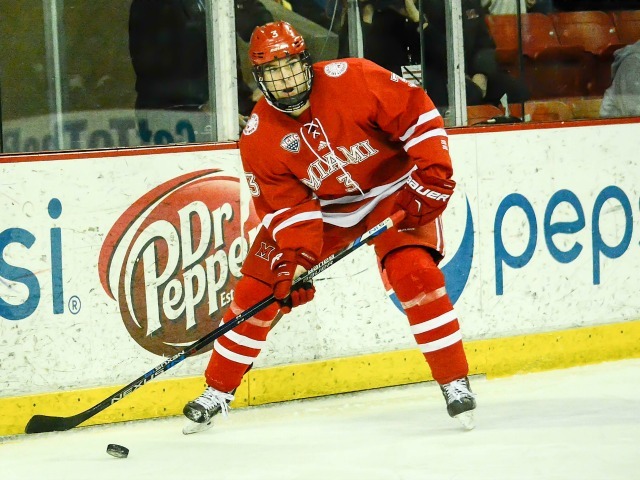 On defense, Jared Brandt was scratched again but should be fine in three weeks. The Munroe start was a bit of surprise, since regular starter Ryan Larkin played well on Friday, but it worked out well. 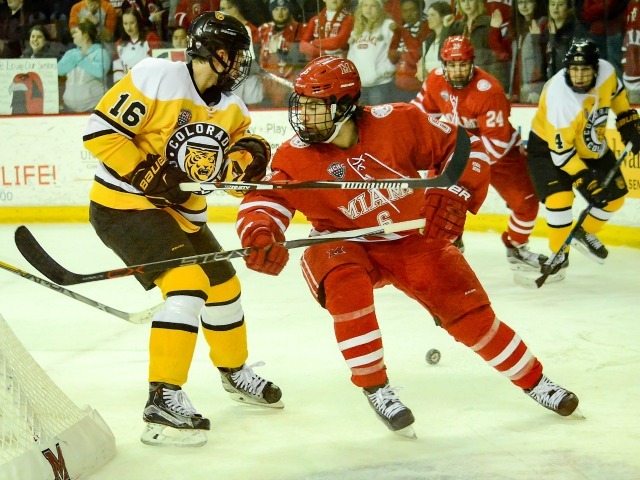 Perhaps Blasi was sending a message to his team about its overall play in Game 1 of the series, or maybe he thought this was a rare chance to give Larkin a break before an arduous second half. 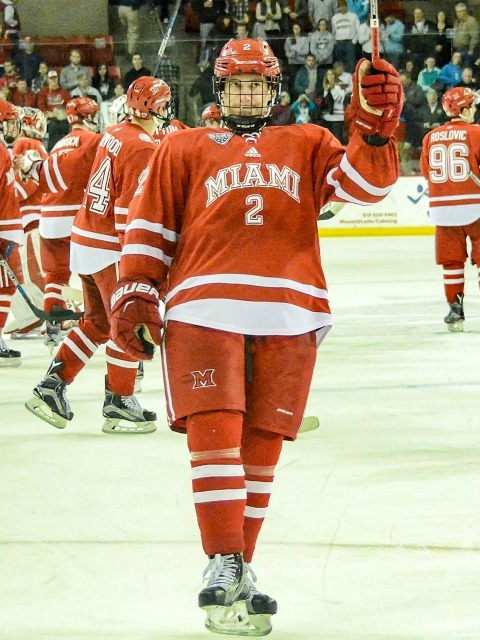 OXFORD, Ohio – It took three late unanswered goals, including an overtime winner by Josh Melnick, but Miami’s winless streak is finally over. 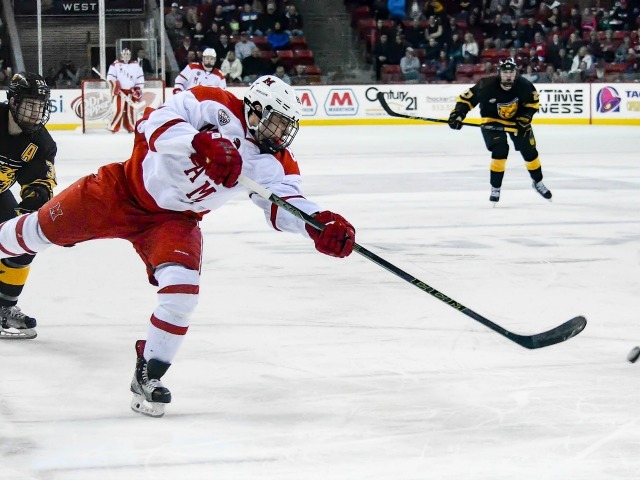 The RedHawks rallied from a two-goal deficit in the third period and ultimately topped Colorado College, 3-2 in the extra session at Cady Arena on Saturday. That snapped a string of 10 straight games without a win for Miami, its longest such span since 1991. 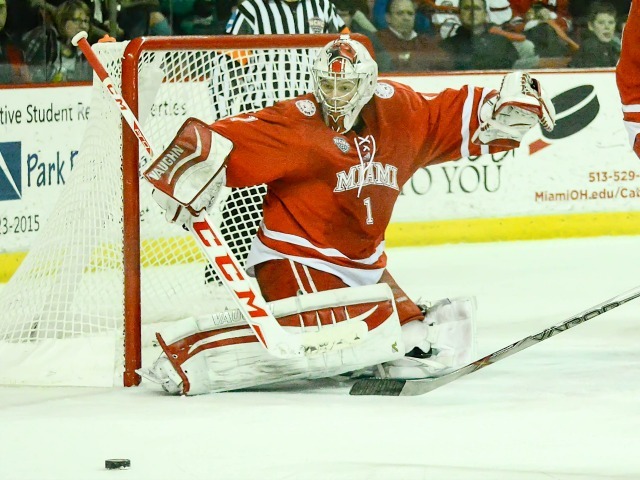 It was also the RedHawks’ first NCHC victory of the season. 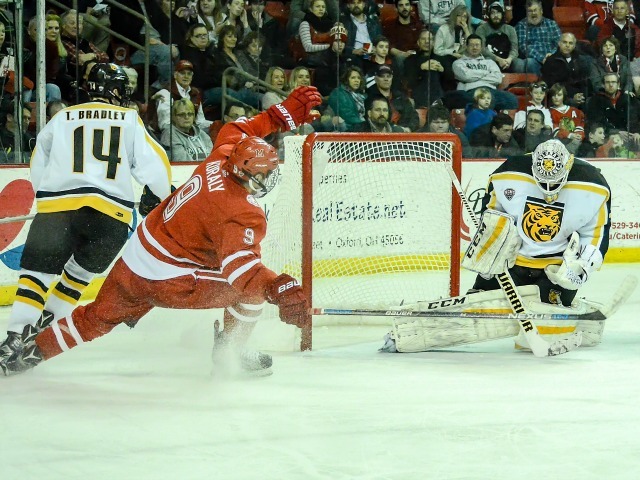 The Tigers (3-12-1) took the lead 4:47 into the game when Alex Berardinelli went in on a breakaway and beat Miami goalie Chase Munroe. 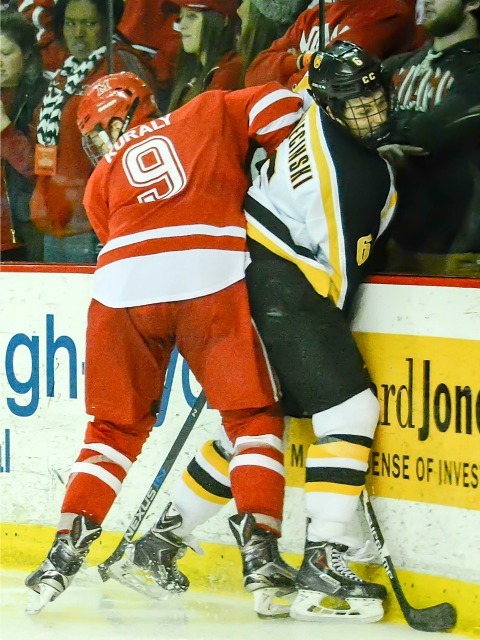 Midway through the second period, Nick Halloran and Berardinelli had a 2-on-0, and Berardinelli was initially denied by Munroe but recovered the puck, skated behind the net and centered to Mason Bergh in the slot for a one-time goal, making it 2-0. 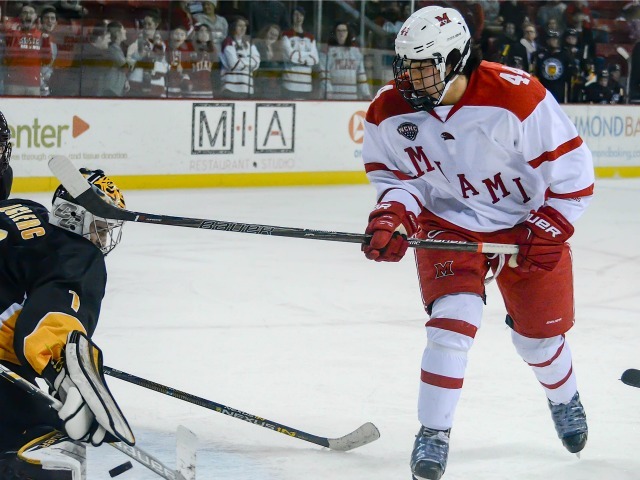 Miami (4-8-5) had been held scoreless for 111 minutes until the 10:02 mark of the third period, when Karch Bachman dumped a self-pass into the corner, skated behind the net and centered to Willie Knierim, who poked it past goalie Alex Leclerc to cut the lead in half. The RedHawks tied it less than four minutes later. Anthony Louis whipped a wrister on net that was blocked at the top of the crease, and the puck bounced to Josh Melnick. 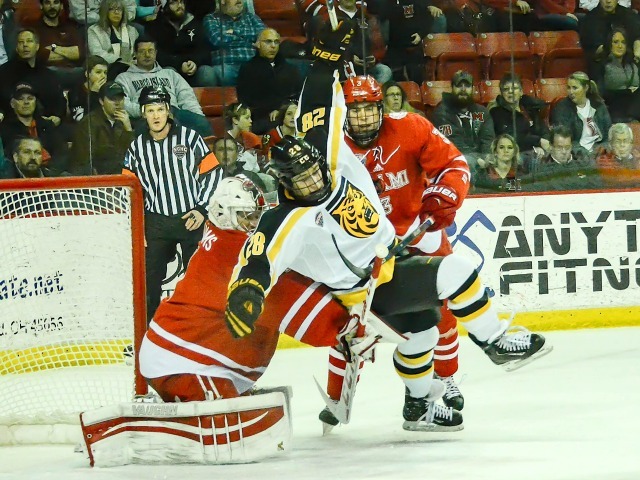 Leclerc made a spectacular toe save to deny Josh Melnick, but the puck slid to the side of the net, where Kiefer Sherwood slammed it home on a delayed penalty. 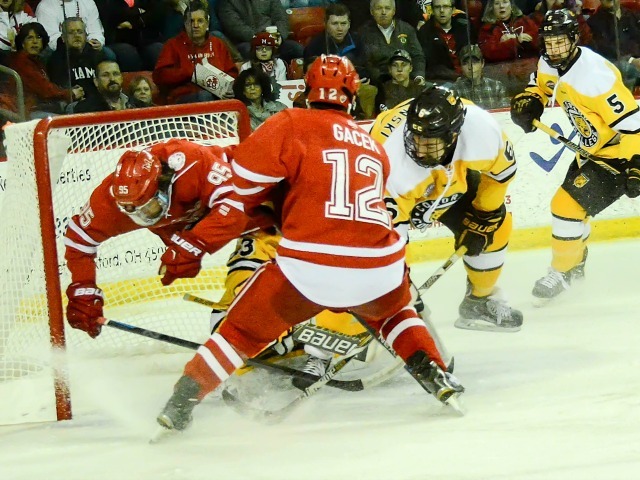 Ninety-four seconds into overtime, Carson Meyer threw one toward the net, and it hit off Melnick, who batted it into the net on the short side to win it. 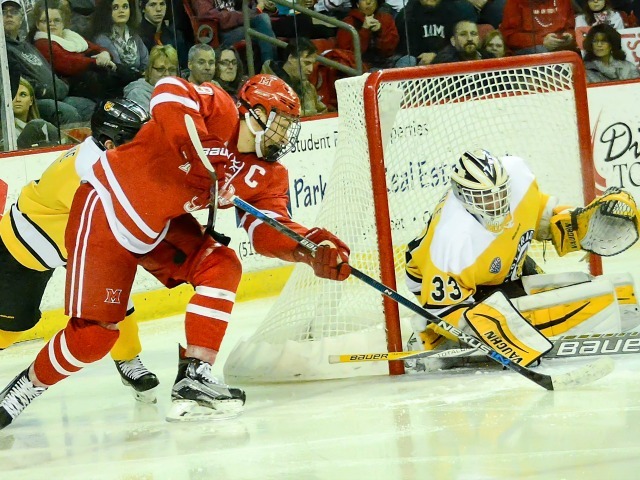 Melnick and Sherwood both finished with two points on a goal and an assist apiece. 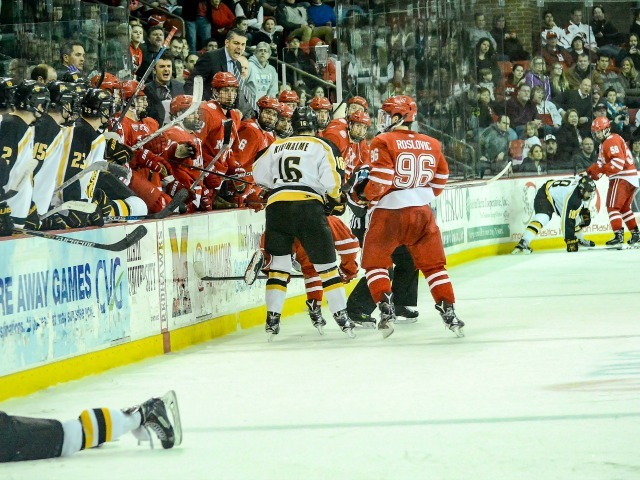 Melnick has five points in his last four games and Sherwood recorded three points on the weekend. 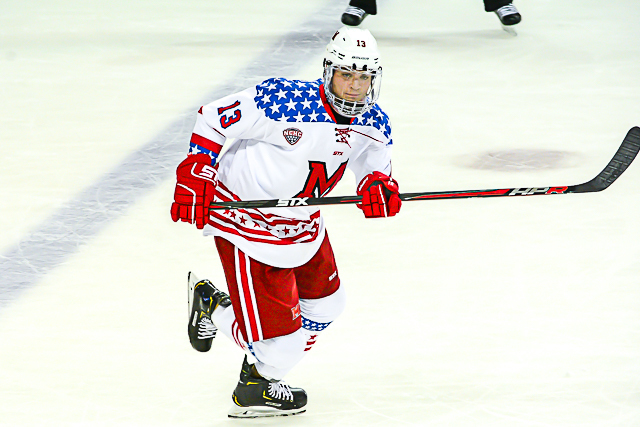 Meyer picked up a helper and owns a team-best four-game point streak. Louis notched his 107th career point and moved into a tie for 44th with Blake Coleman on the RedHawks’ all-time scoring leaderboard. 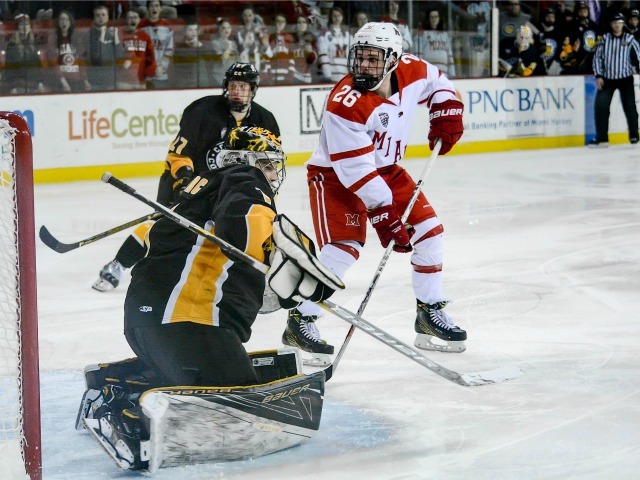 Goalie Chase Munroe turned 18 shots aside to earn his first collegiate victory. 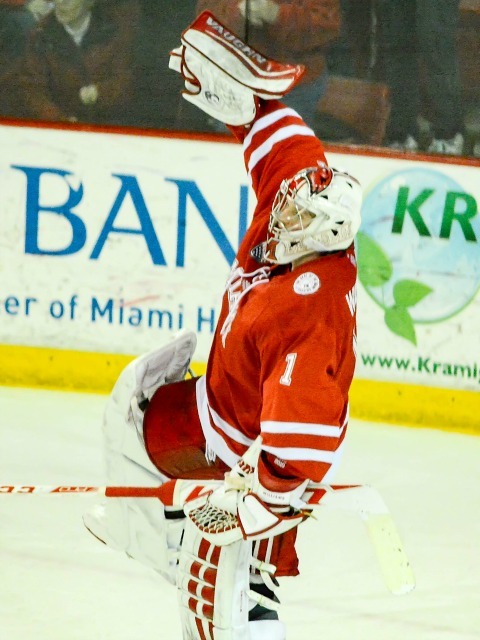 It was the first win for Miami since Oct. 28 – which also came in overtime. 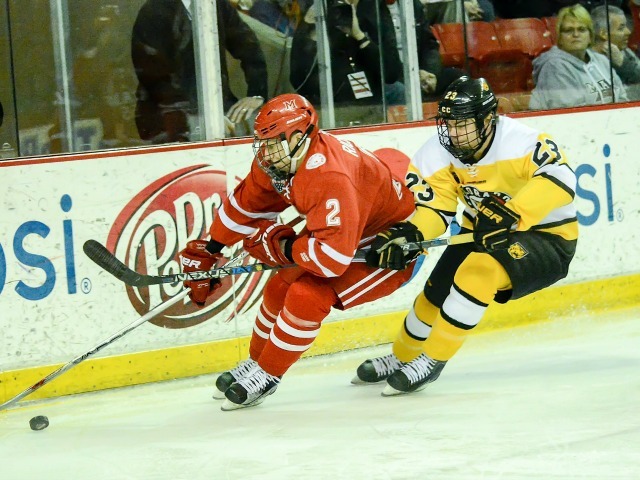 The RedHawks moved into solo control of seventh place in the conference. Miami is off the next two weekends and resumes play at 4 p.m. on Dec. 31 at Ohio State in the back end of a home-and-home series. The teams tied when they met in Oxford on Oct. 15. 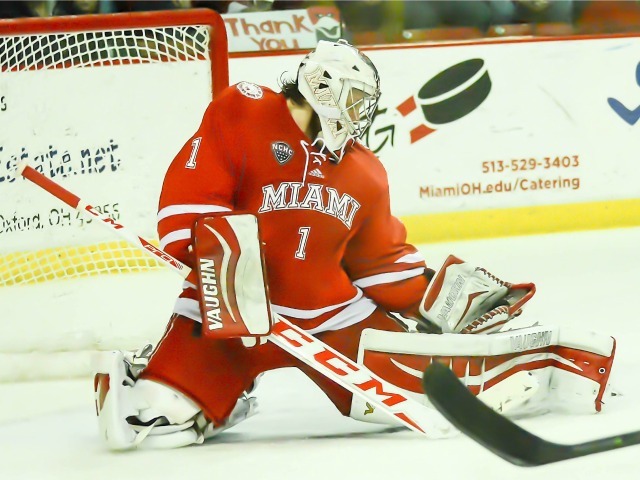 OXFORD, Ohio – Surely Miami’s winless streak has to end on Saturday, right? 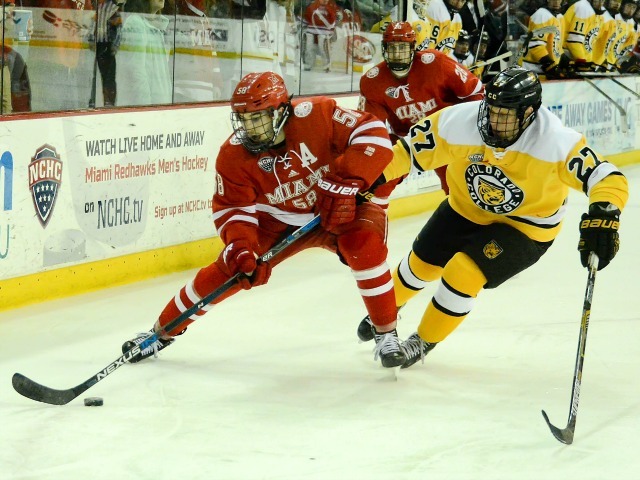 If the RedHawks can’t at least earn one win on its home ice against Colorado College, MU will have to beat a top-20 team to snap its skid, since every one of its remaining opponents is ranked. 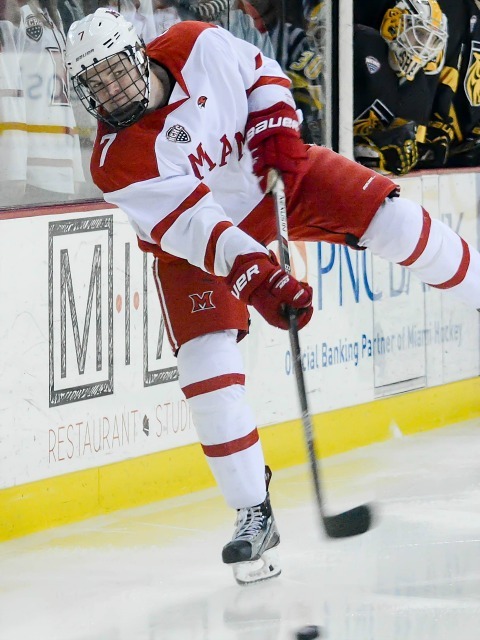 The RedHawks skated to their 10th straight non-win on Friday, tying the Tigers, 1-1 at Cady Arena. 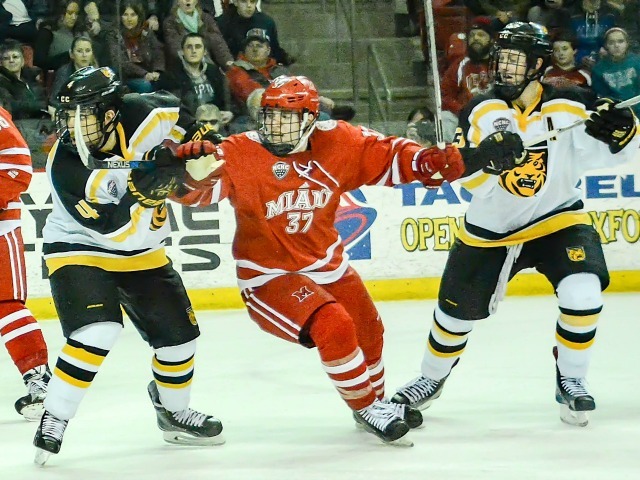 It was Miami’s third consecutive NCHC deadlock, and the team has yet to win in conference play (0-4-3). 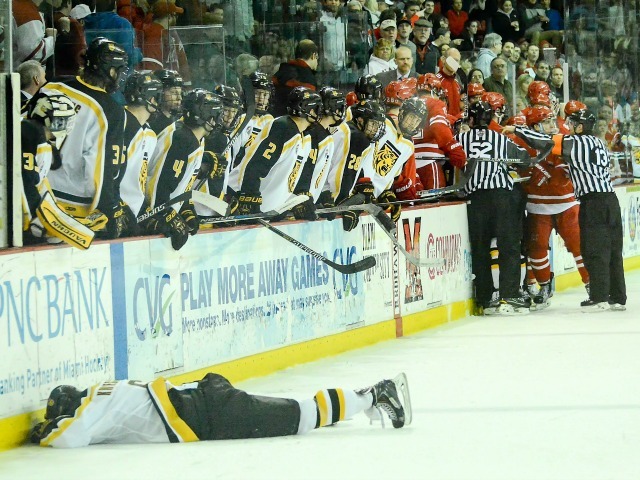 After its series finale vs. CC on Saturday, MU is off the next two weeks, then it’s off to Ohio State. The Buckeyes are ranked No. 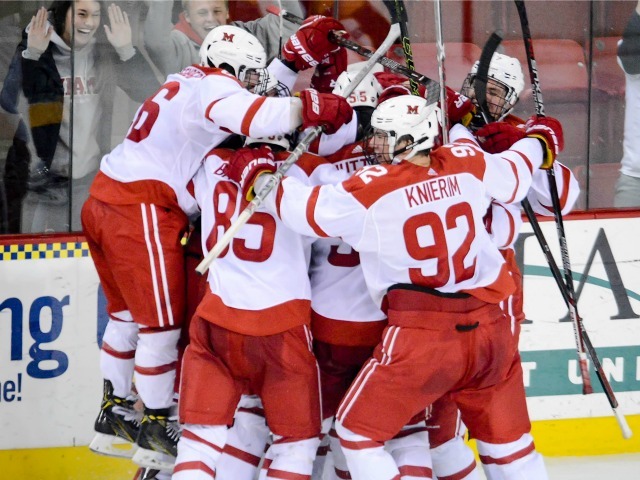 10 in the USCHO poll. Here’s the remaining schedule with team rankings. Now back to this series. 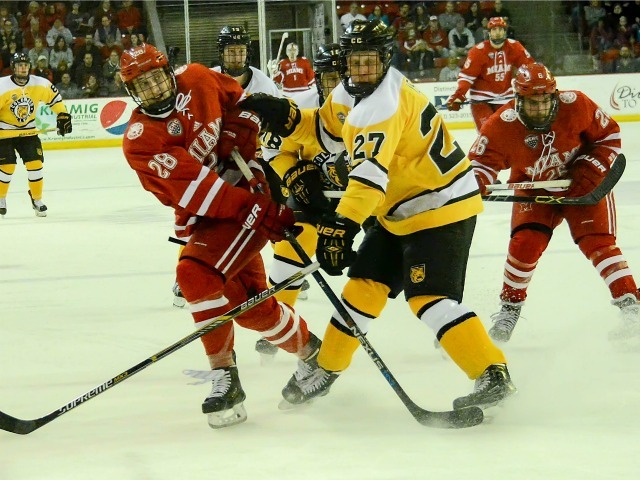 The Tigers entered this weekend having lost seven straight and had allowed 31 goals in that span. Only one of their first 14 opponents had been held to one goal, yet Miami was unable to get out of the binary range. Considering both teams’ woes, it’s sort of fitting that neither team would come away from Friday with a win. But this can’t happen for Miami on Saturday if it wants to salvage this season. The RedHawks’ finale against CC is their 17th game of the season. 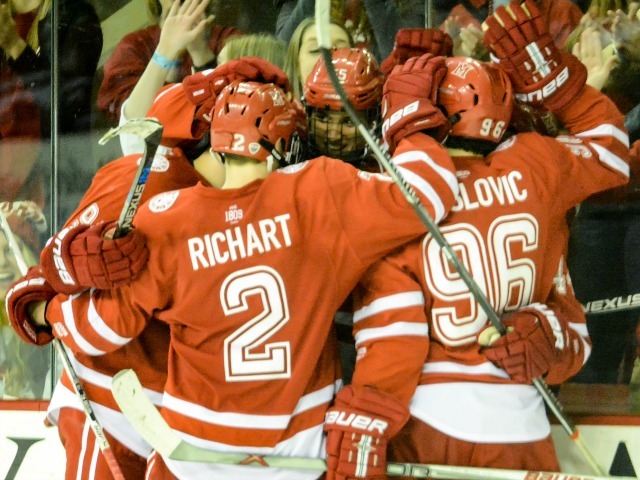 A win would put them at 4-8-5, and they would probably need to go at least 12-5 for get into PairWise-at large consideration. A tall order, certainly, but a loss in this one would force a 13-4 finish or better. Reference the above remaining schedule to see Miami’s chances, or any NCAA team’s odds of winning 13 of 17 against those opponents. 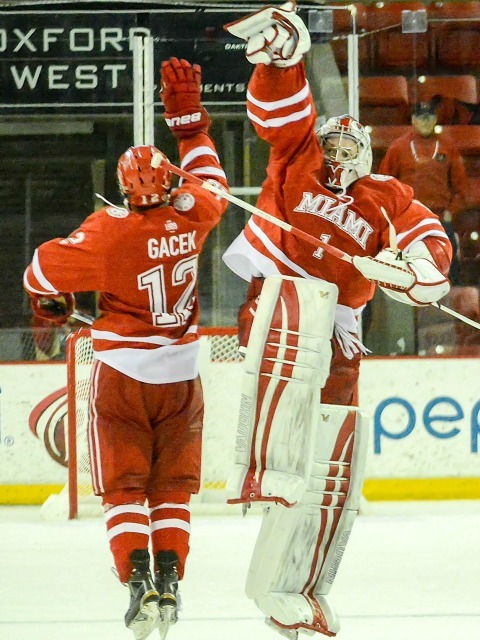 Twelve wins in 17 would give Miami 43 points with a win vs. Colorado College and 40 with a loss. 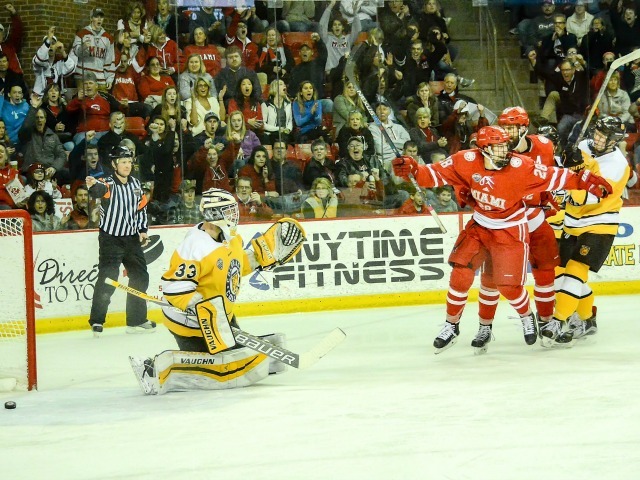 That could be the difference between an all-important fourth seed and home-ice advantage in the first round of the NCHC’s or a fifth seed and a road trip in a hostile rink to extend its season like in 2015-16. 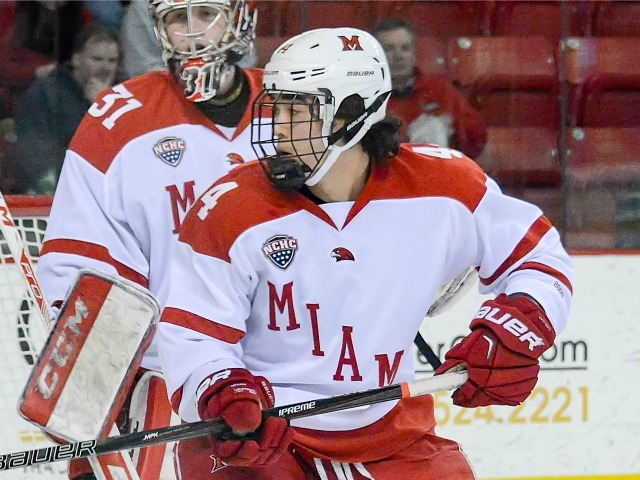 The RedHawks have a ton of work to do if they hope to get back into NCAA consideration but that workload increases substantially if they can’t pick the only low-hanging fruit remaining on their schedule. – This game was actually pretty boring, which can be expected when two teams that aren’t playing well show why their records are where they are. 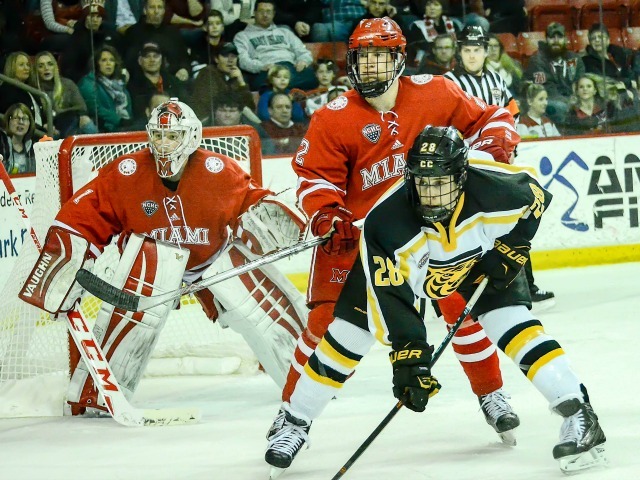 But just based on Friday’s 65-minute sample, it doesn’t look like Colorado College has the talent to compete in this league, while Miami is underachieving among other issues. 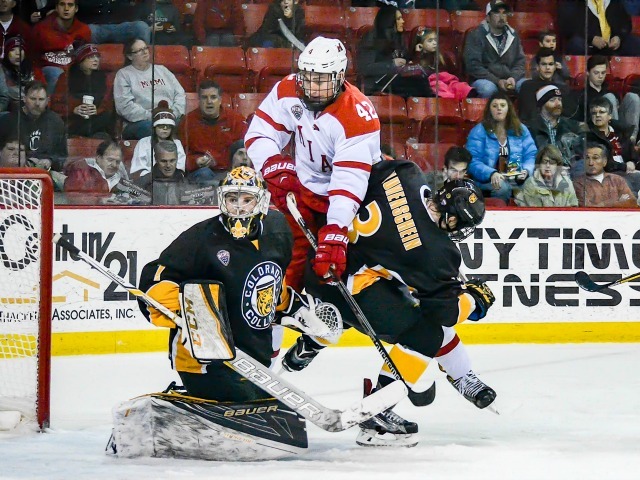 Heading into the second half of the year, the RedHawks are in the better position to turn things around. 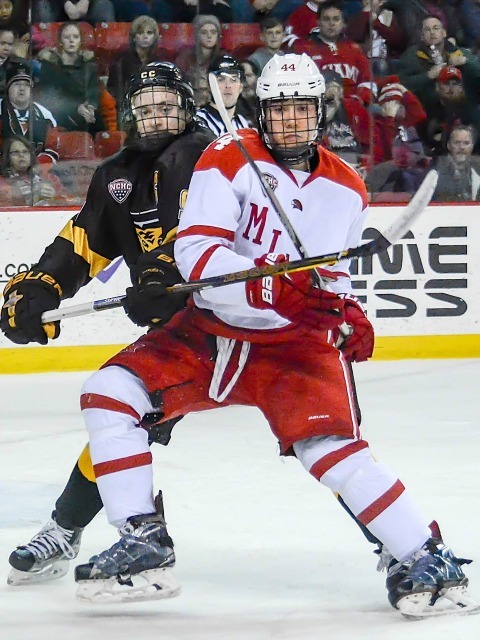 – Coach Enrico Blasi has been playing with the lines, and one interesting combination was Gordie Green, Josh Melnick and Karch Bachman. 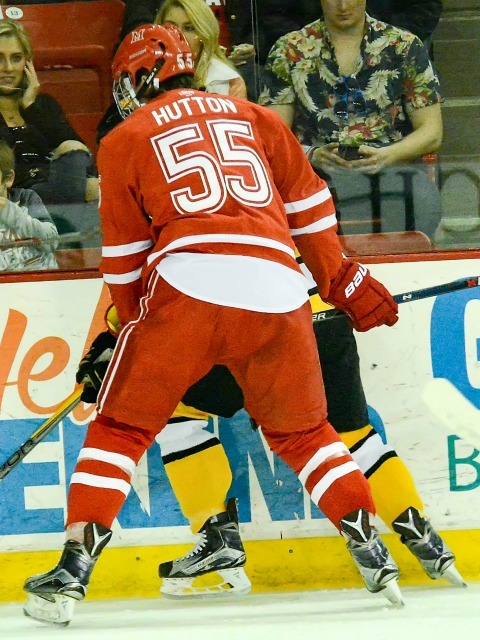 Green was a solid point producer in the USHL but he has just four this season and two since opening night. 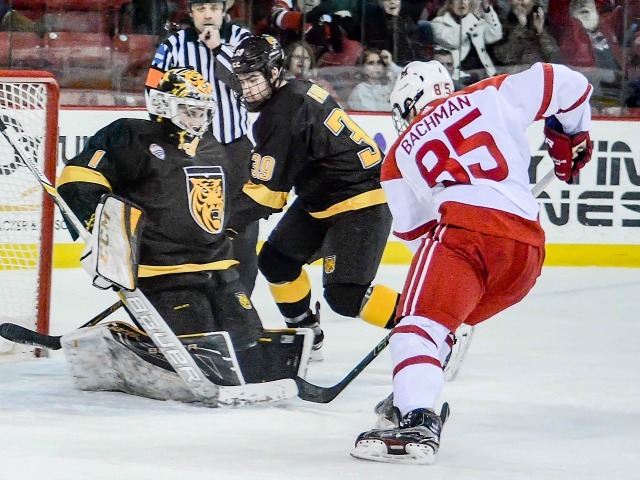 Bachman has blazing speed and a great shot but he hasn’t been cast into a role in which he can thrive. Green set up Bachman with a couple of great passes and Bachman nearly found the net. It’s a small line with a ton of speed and has a lot of potential. 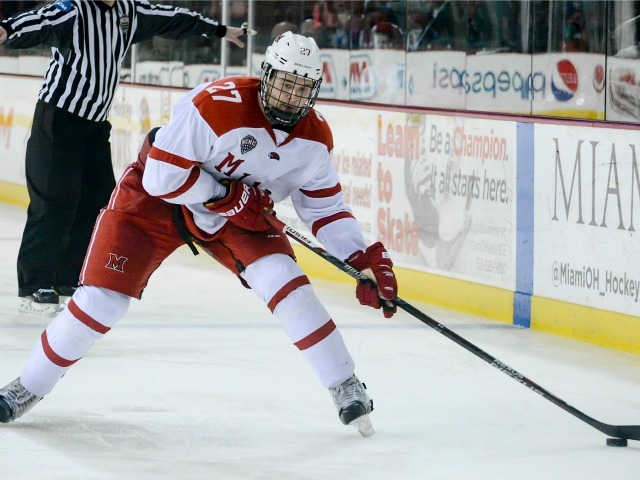 – Speaking of Melnick, he was double-shifted nearly the entire second period, joining the fourth line as well as his own. Colin Sullivan was listed as a forward but played a significant amount of defense and Melnick absorbed much of his ice time up front. 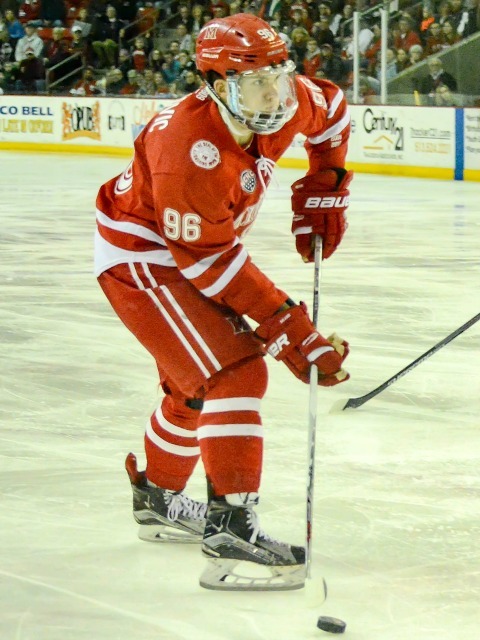 – Can’t take credit for this line – heard it used by Mike Babcock but not sure if he was the originator either – but if Miami’s power play gets much worse the RedHawks want to consider declining penalties. In six minutes on the man advantage Miami generated one shot. MU has not scored a PPG in five games. – The attendance for this one was a season-low 1,992 despite class still being in session. That’s the worst gate total at Cady since Jan. 9 during the J-term. If this team doesn’t get better expect a half-empty arena the second half of the year. FORWARDS: D+. 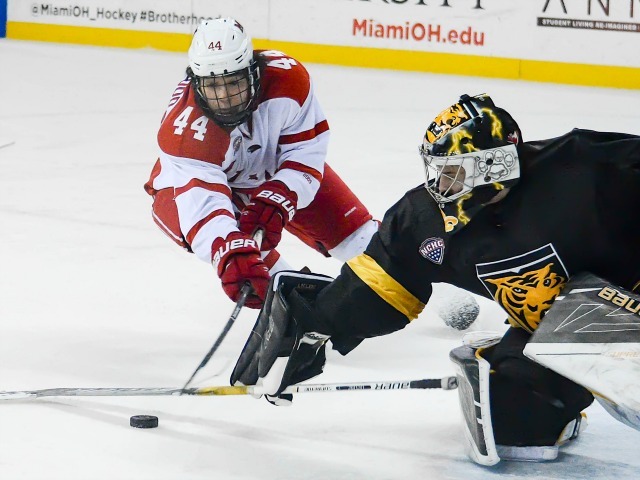 Colorado College isn’t an impressive lot yet Miami scored just one goal. 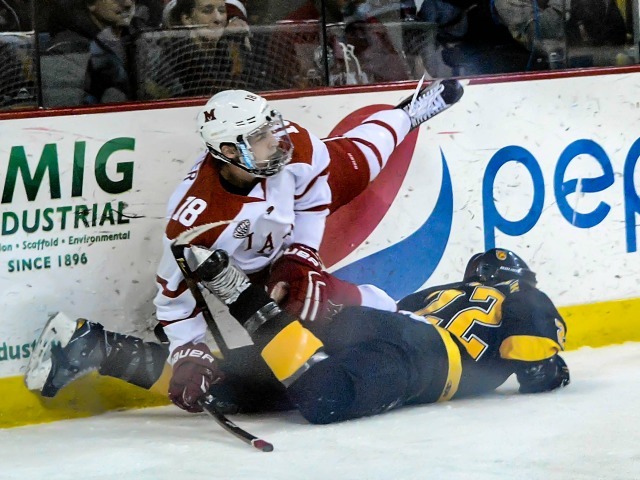 The RedHawks had some dominant stretches but that should be a given against a team that is 3-11 and ranked in the bottom 20 percent of college hockey. Louis did have eight shots. Justin Greenberg continues to get better on faceoffs and may be the team’s best forward on draws at this point. DEFENSEMEN: B. This corps kept the mistakes to a minimum, which has not always been the case this season. Grant Frederic quietly seems to get better every game. 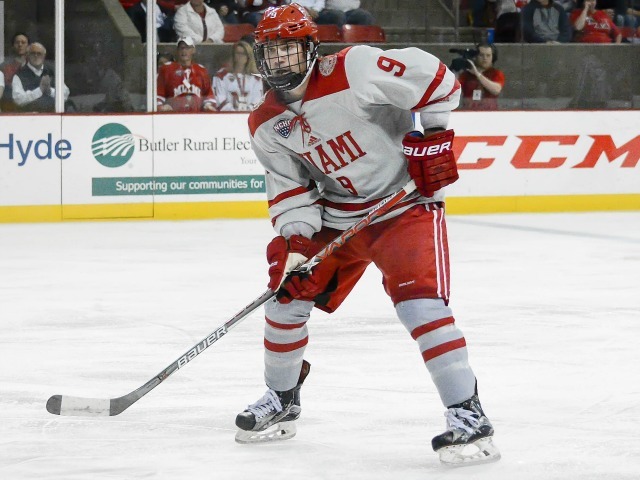 The strange thing with Miami’s defensemen is that three seasons ago only Matthew Caito appeared to have the green light to join the rush, and the other blueliners would act like they had bungie cords tied to them when they reached the blue line. Now all six/seven jump in all the time, sometimes even going behind opponents’ nets. Can there be a happy medium? GOALTENDING: B+. Ryan Larkin was solid as usual but didn’t see a ton of high-percentage shots. He continues to do a fantastic job with positioning and controlling rebounds. 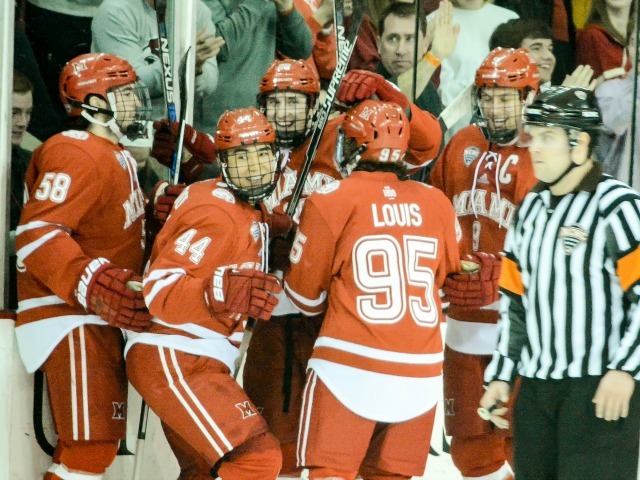 Not sure what happened on the goal – it was a weird angle and seemed to surprise Larkin. It didn’t look like he saw it very well. What a goalie allows one goal his team should win most nights. LINEUP CHANGES: Can this team ever get completely healthy? Jared Brandt missed his second straight game with an upper body injury but shouldn’t be out much longer. He has been a solid stay-at-home defenseman on a Miami team that has really needed a solid stay-at-home defenseman. 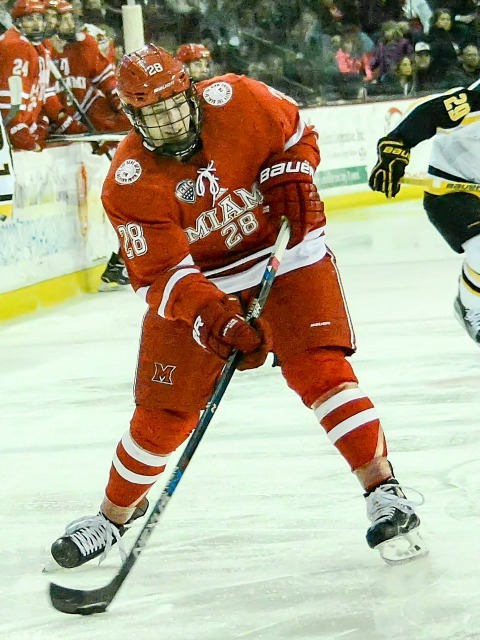 The RedHawks played their other seven defensemen, with Sullivan listed at forward to start the game. 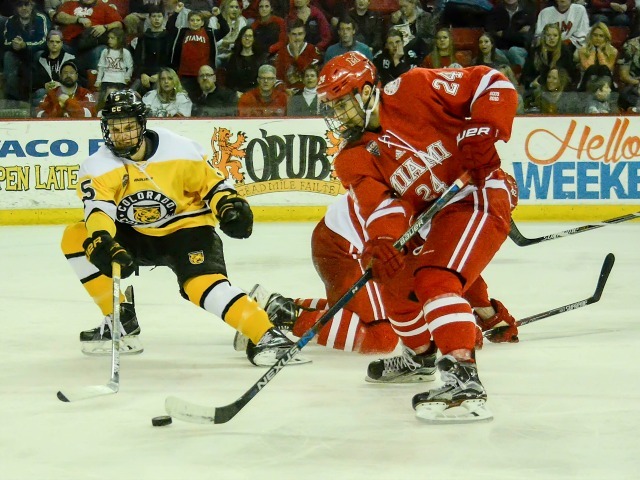 At forward, Willie Knierim was a rare scratch and Alex Alger sat for the third straight game. OXFORD, Ohio – At least Miami won the shootout. 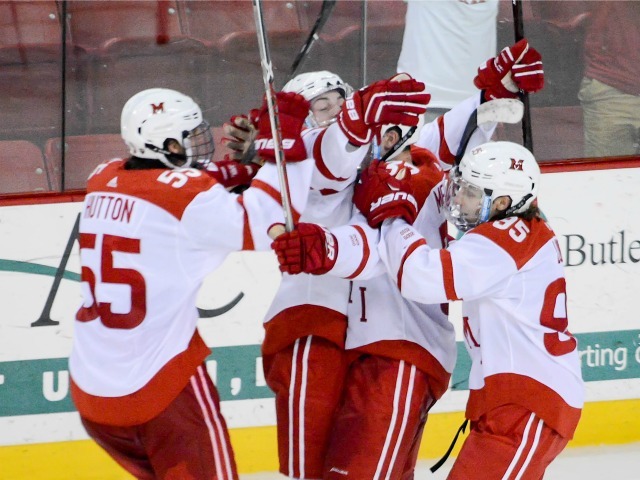 Although the RedHawks officially tied Colorado College, 1-1 at Cady Arena on Friday, MU picked up the extra league point by topping the Tigers in sudden-death penalty shots. 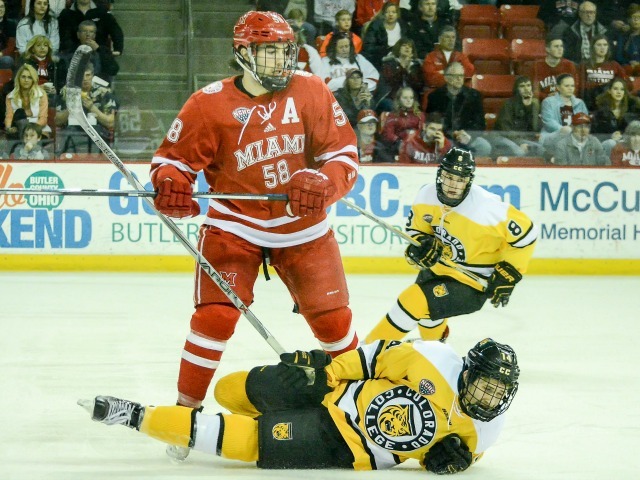 Despite earning two of a possible three points, Miami (3-8-5) saw its winless streak extended to 10 games and has yet to win an NCHC game, as its league record is now 0-4-3. 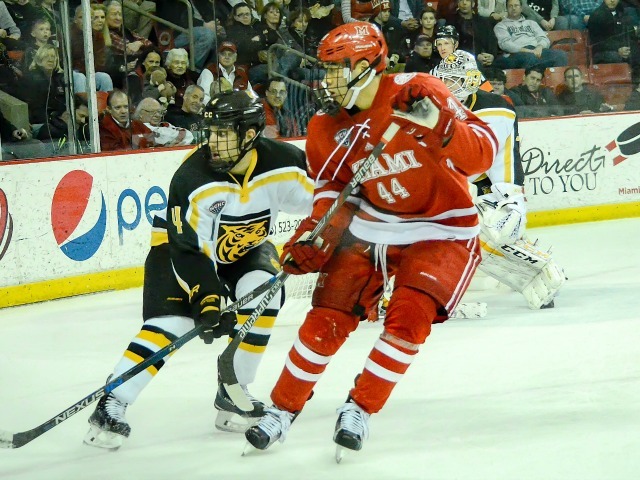 The RedHawks’ last three conference games have ended in ties. 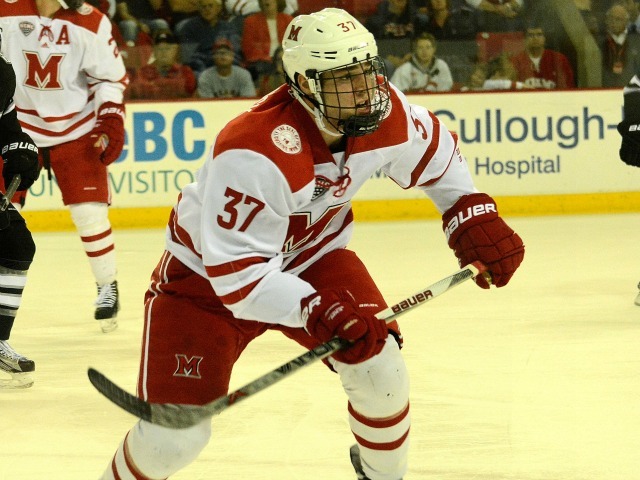 Miami (3-8-5) took the lead early, as Anthony Louis netted his team-leading 10th goal. 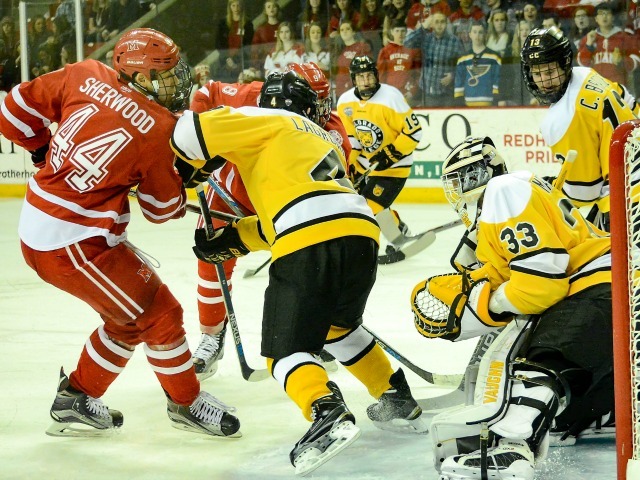 Kiefer Sherwood slid a short pass to Carson Meyer before being hit the blue line, and Meyer eluded a defender before connecting with a streaking Louis, and Louis buried the one-timer 3:16 into the first period. 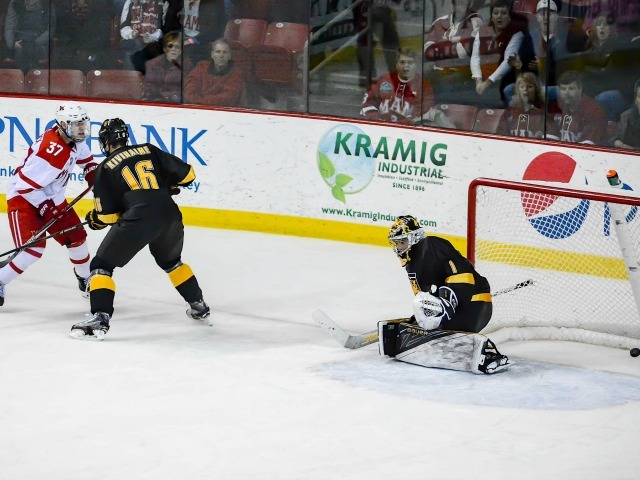 Colorado College (3-11-1) evened the score with 3:36 left in the second period as Luc Gerdes stole a puck deep in the offensive zone and threw the puck in from a bad angle along the goal line. 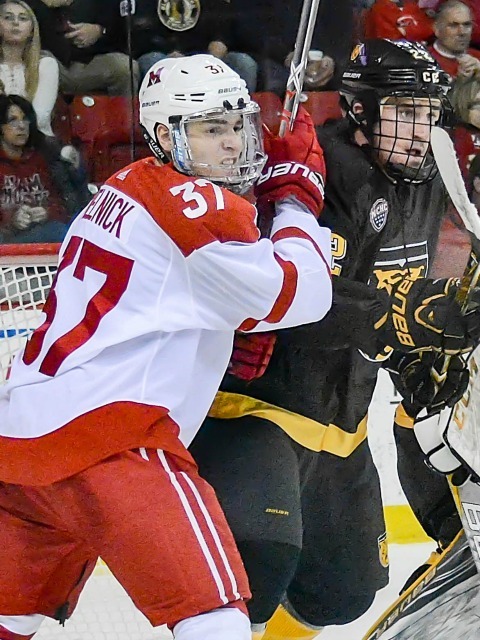 The RedHawks outshot the Tigers, 28-18 over the final two periods and overtime but could not regain the lead, going scoreless over the final 61:44. Miami is now 0-7-3 during its skid, the team’s longest winless stretch since 1991. 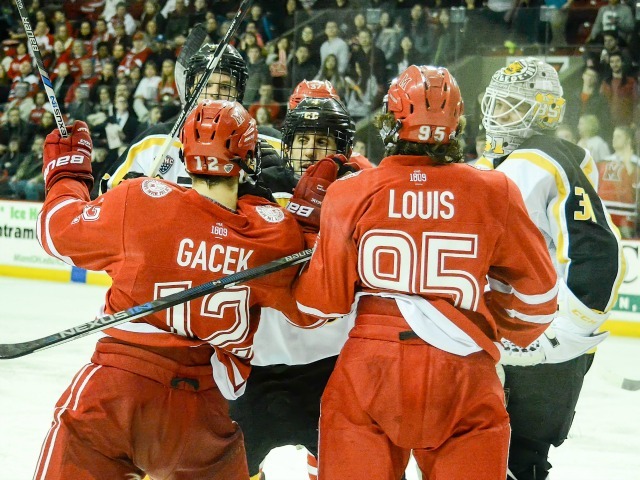 Despite leading the RedHawks in goals, Louis’ was his first in six games. He has picked up points in 12 of his last 14 contests. 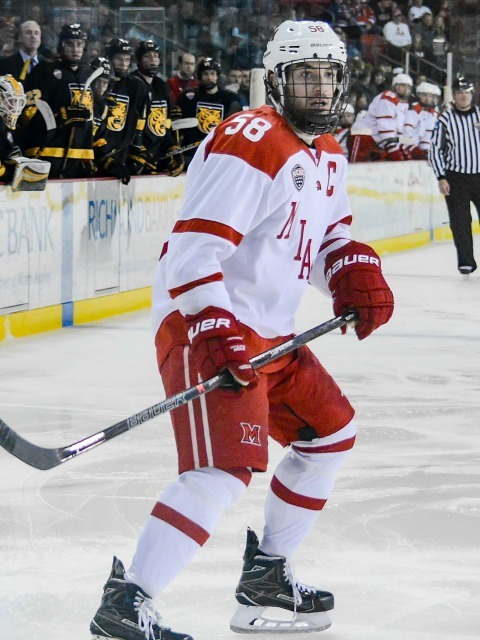 Sherwood earned his first point in four games, and Meyer has now tallied a point in all three games since returning from an illness, going 2-2-4. 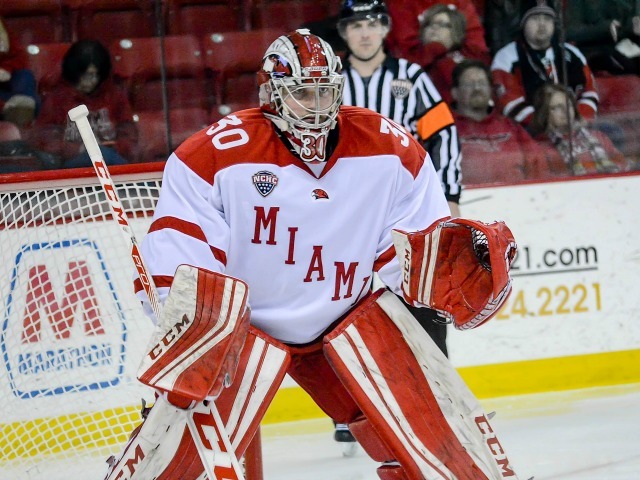 RedHawks goalie Ryan Larkin stopped 25 shots. 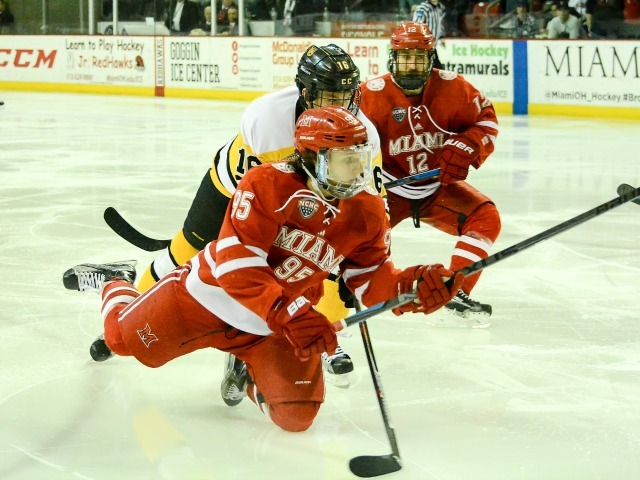 Miami moved into a tie for seventh with the Tigers in the NCHC by winning the shootout, however the RedHawks fell further in the PairWise, slipping to a tie for 43rd. The teams wrap up their series at 7:05 p.m. on Saturday. 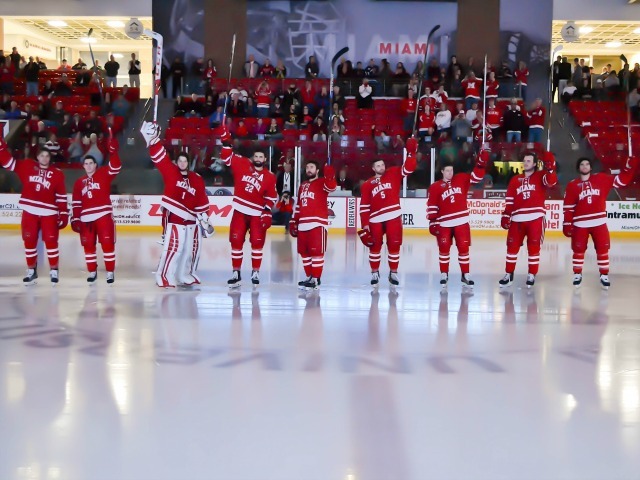 OXFORD, Ohio – Playing in his final Miami regular season home game, Jay Williams made sure his name would be imprinted in the team record book. 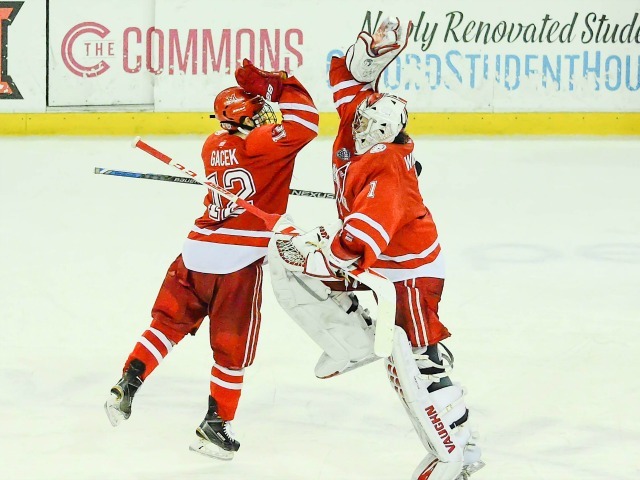 The senior goalie stopped all 24 shots he faced to complete a double shutout weekend and series sweep as the RedHawks beat Colorado College, 4-0 on Saturday. 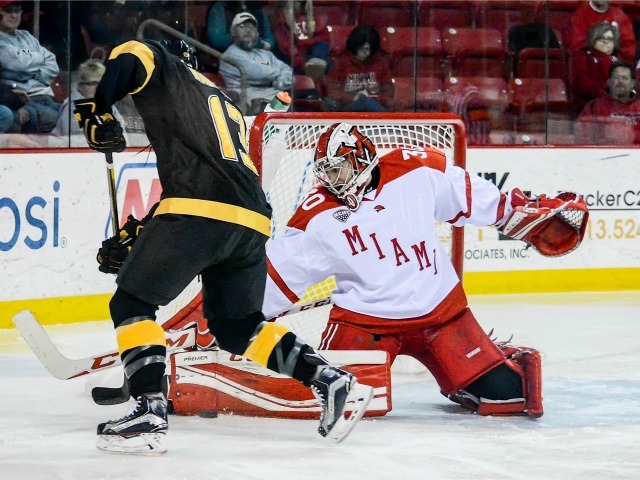 Williams became the first Miami goalie ever to blank an opponent in both ends of a weekend series, and he also set the team mark for longest consecutive scoreless streak at 148:52, edging out Cody Reichard by over seven minutes. Williams also moved into a tie with Connor Knapp for fourth on the school wins leaderboard with 46, and he is now even with Ryan McKay for fourth place with nine shutouts. 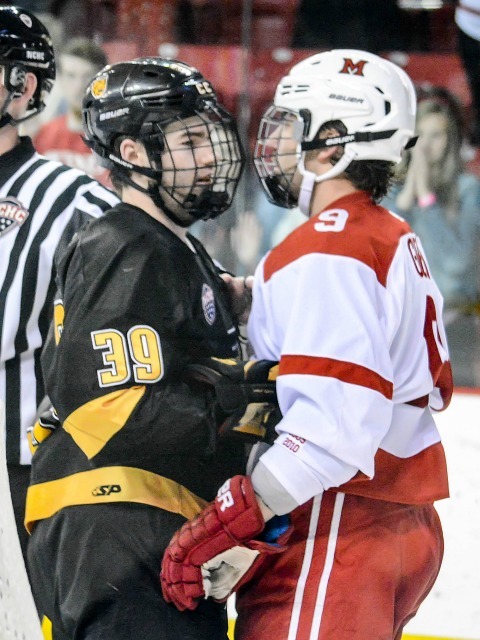 The game was scoreless until the second period, when a wrister by senior defenseman Taylor Richart beat Tigers goalie Tyler Marble with 6:56 left in that frame. 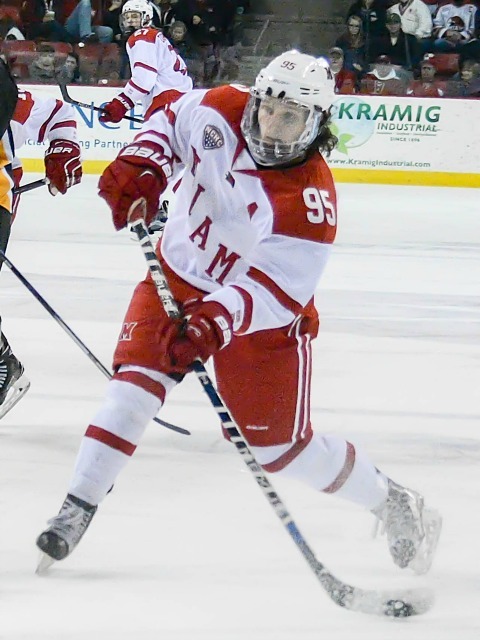 It remained 1-0 until senior forward Kevin Morris whipped a shot into the bottom corner of the net from the slot on the power play with 8:56 left in regulation. Just 1:27 later, freshman forward Kiefer Sherwood backhanded a shot that slid under Marble’s pads to extend the RedHawks’ lead to three. 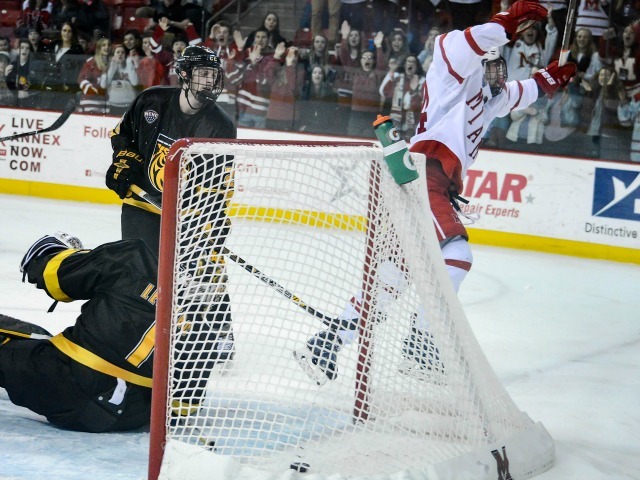 A fraction of a second before the final horn, junior forward Anthony Louis punched in an empty goal to cap the scoring. 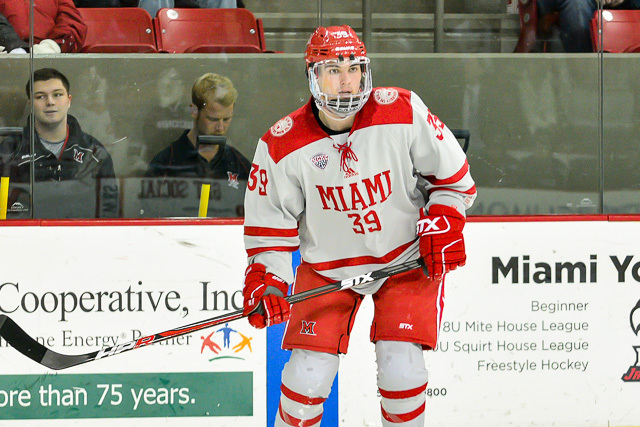 Freshmen forwards Josh Melnick and Jack Roslovic led Miami in points with a pair each, both on assists. 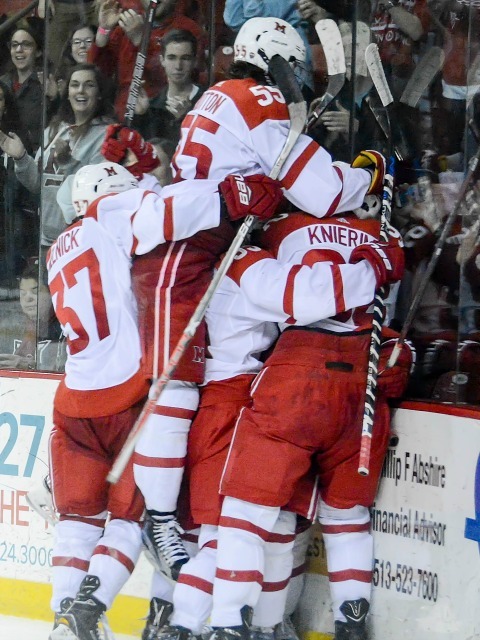 Melnick wrapped up the weekend with a goal and three helpers, giving him 13 points in his last 13 games. 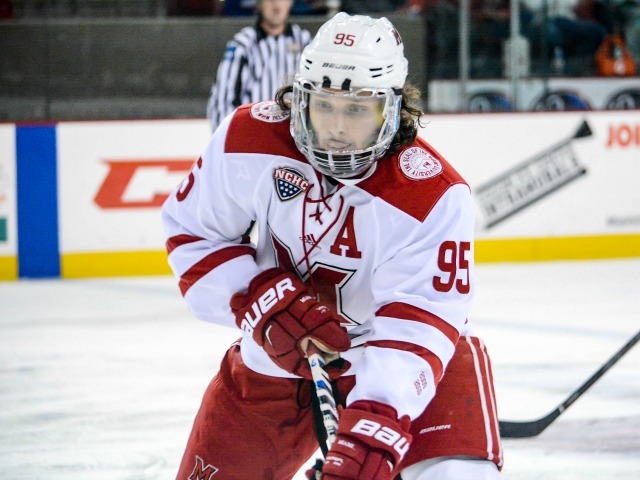 Sherwood scored his sixth goal in eight games and extended his points streak to a team-best six games, and Morris recorded his third marker in his last four. 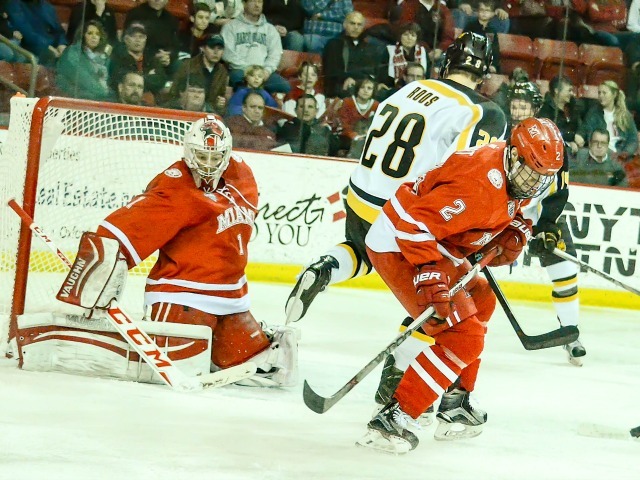 MU avenged its earlier two losses at Colorado College (6-25-1), as the teams finished the regular season 2-2 against each other. 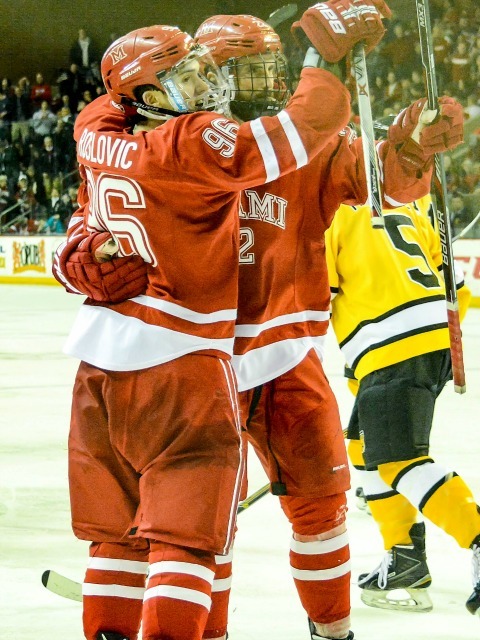 The RedHawks have won five of their last six and are 9-3 in their last 12, moving above .500 for the first time since Oct. 24 when they were 3-2-1 before a loss to St. Lawrence. 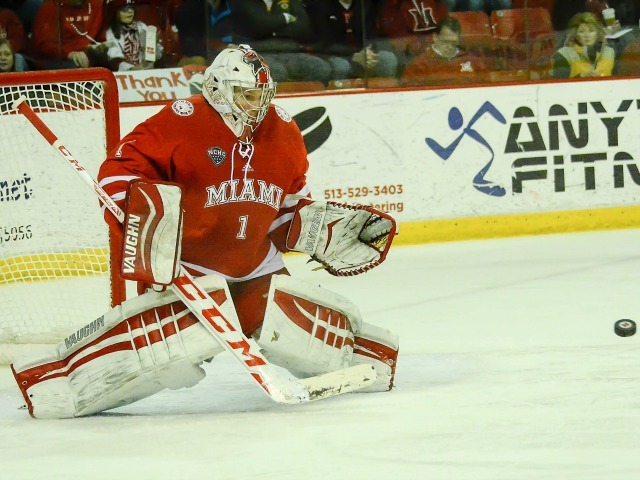 Miami (15-14-3) remains tied for fourth in the conference standings with Minnesota-Duluth, which swept St. Cloud State on the road this weekend. 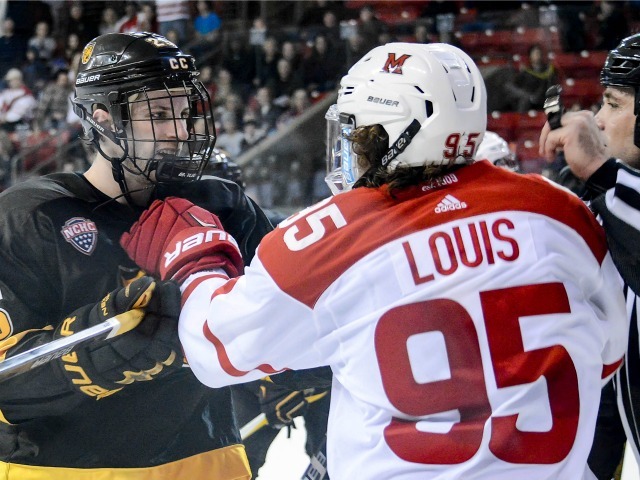 The RedHawks and UMD play each other next weekend in Duluth to wrap up the regular season, and they will almost certainly meet again the following week in the first round of the NCHC Tournament. 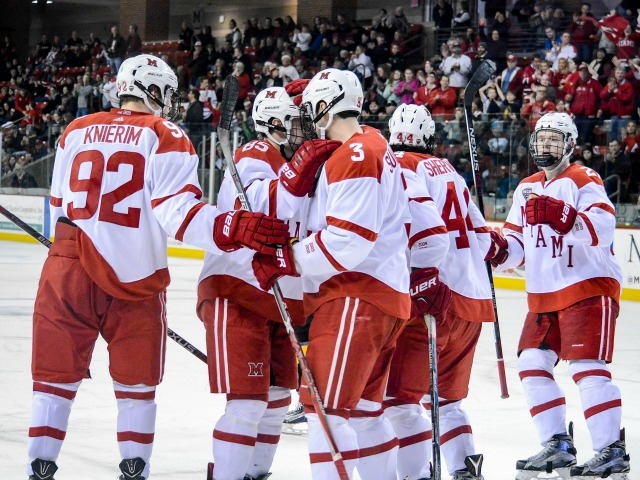 Next week’s series will determine which team is home for the best-of-3 NCHC opener, with Miami needing a winning record on the weekend to send it to Cady Arena. 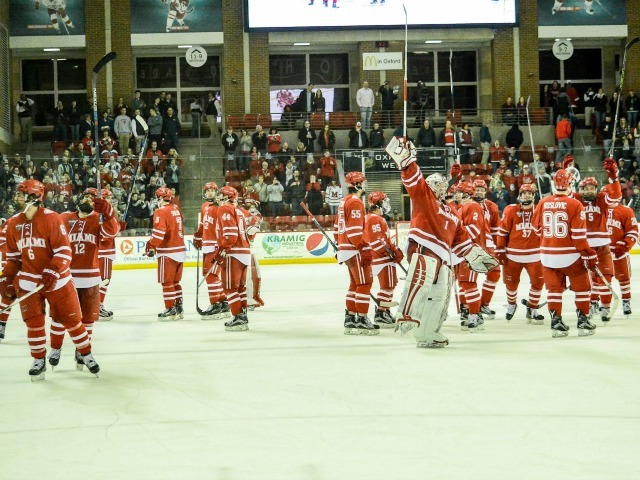 With the win, the RedHawks moved up to 18th in the PairWise rankings. 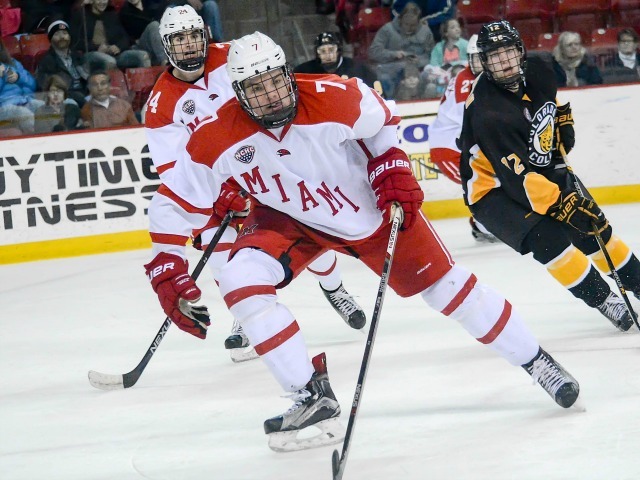 Miami’s games at Minnesota-Duluth will be Friday and Saturday, with both starting at 8:07 p.m.